1947 WILLYS CJ-2A 1/4 TON 4X4,L4-134 "GO DEVIL"134CI 4CYL ENGINE,MANUAL TRANSMISSION,WIPERS AND TURN SIGNALS,NEW GAUGES INCLUDING SPEEDOMETER/ODOMETER,RECENT RESTORATION,RUNS AND DRIVE EXCELLENT!!! TURN KEY AND READY TO DRIVE AND ENJOY!! 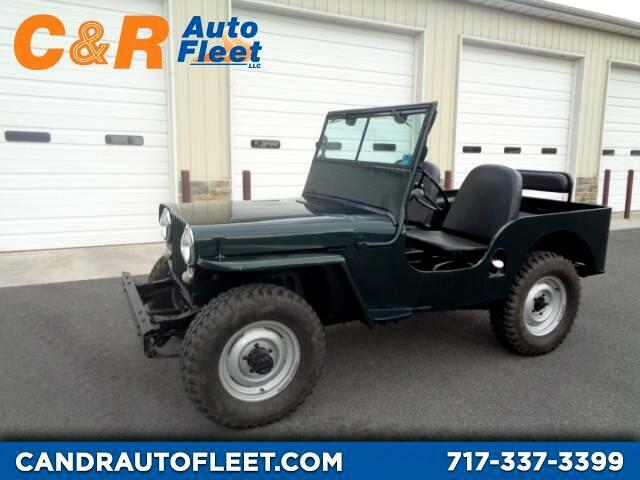 Visit C & R Auto Fleet online at www.candrautofleet.com to see more pictures of this vehicle or call us at 717-337-3399 today to schedule your test drive. Message: Thought you might be interested in this 1947 Jeep Willys.